– Mix all ingredients in a food processor. Add water as needed to thin the consistency and season to taste. Reserve 1/2 for serving and 1/2 for marinade. – Trim flat iron or skirt steak of all big pieces of fat and sinew. 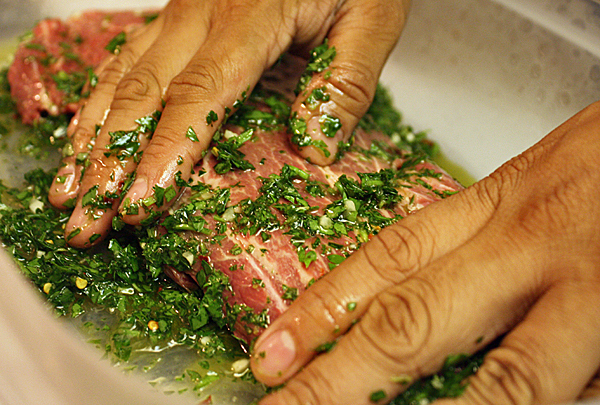 – Place trimmed steak in a large ziploc bag and add the chimichurri that you reserved for the marinade. – Coat the steak well in the marinade and marinate for at least an hour, and preferably overnight. – Preheat the grill over high heat. Spray grill with cooking spray. Grill steak to your desired doneness. – Let rest and prepare for slicing before serving. -Preheat oven to 450 F.
– In a medium bowl toss sweet potatoes with oil, salt, pepper, ancho powder, and paprika. Transfer to a roasting pan and roast the potatoes until tender. About 12-14 minutes. – Grill the corn while you grill the steak. When done, cut the kernels off the cob. – When potatoes are done. Toss with corn, diced tomato, and cilantro. To plate: Put about 1 cup of the roasted sweet potato hash on the plate. Slice the steak across the grain about 1/4-1/2 inch thick. Drizzle the steak and around the plate with 1-2 T of chimichurri. Serve.